The tragedy that unfolded behind Malaysia Airlines flight MH17 being shot down has now resulted in other flights diverting course. A smart choice, as reports now state the the Ukraine militia is warning others to stay out of their airspace. Google Translate is fairly rough, but the points of it still come across. 17.07.2014 17:50 (MSK) Message from the militia. "In the area Torrez just downed plane An-26, lying somewhere in the mine" Progress. " Also warned - do not fly in "our sky." And here is the confirmation of the next video "ptichkopada." Bird fell for waste heap, the residential sector is not caught. Civilians are not injured. 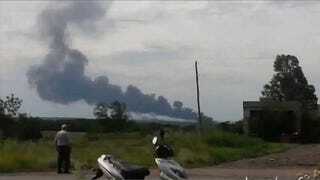 And also have information about the second downed aircraft, like the Su. " Any Russian speaking Jalops that can better translate this? Scary to read. We're seeing reports that the source of this news is a "fan page" and not official. We'll update if that's the case.